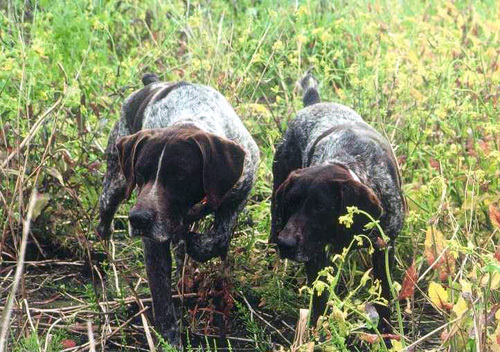 Our goal is to produce a limited number of pups with outstanding Natural Ability - pups that the average enthusiastic hunter with limited time and training experience can turn into great hunting companions. As an Animal Geneticist by training and profession, I am a strong supporter of NAVHDA testing. Our personal dogs have all achieved maximum scores in Natural Ability tests and done well in Utility tests - four have qualified for the NAVHDA Invitational. Thirty seven Chippewa pups have run NAVHDA Natural Ability tests (31 of them handled by first-time novice handlers) - 35 passed, earning six Natural Ability Breeders Awards. We are located in Oregon amidst the greatest variety of hunting opportunities anywhere in the U.S. We hunt waterfowl, eight species of upland birds, and a variety of big game - and use the dogs for all of it including trailing wounded deer when necessary. Our dogs do it all - we invite you to explore this website and learn more about them.